U.S. Sen. Roy Blunt (R-MO) speaks to the media while flanked by Senate Minority Leader Sen. Mitch McConnell (R-KY) after the weekly Senate Republican policy luncheon at the U.S. Capitol January 29, 2013 in Washington, DC. We’ve yet to see the precise text of the Senate GOP’s new Balanced Budget Amendment, part of the new campaign to shift the onus of irresponsibility back onto the Democrats. 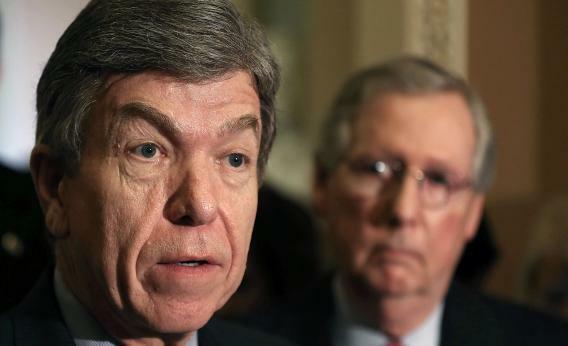 But Sen. Roy Blunt’s office is passing around the bullet points. · Presidential Requirement to Submit a Balanced Budget. Prior to each fiscal year, the President must submit to Congress a balanced budget that limits outlays to 18 percent of GDP. · 18 Percent Spending Cap. With limited exceptions, Congress must limit outlays to 18 percent of GDP. · Supermajority for Tax Increases. Establishes a new supermajority requirement for net tax and rate increases. · Supermajority to Raise the Debt Limit. Establishes new supermajority requirement for an increase in the debt limit. So it’s not just an amendment that forces Washington to balance the budget. It’s an amendment forcing Washington to balance a budget without tax increases, coming up with the savings entirely from cuts. Given how the House GOP’s current demand on the president is for a budget that balances in 10 years, this is an impressive exercise in goalpost-moving. And, given that an identical amendment petered out in 2011, when Republicans had more House and Senate seats, this is all just deeply unserious. Don’t ask me—ask the liberal RINO Alinskyites over at Bill Buckley’s place. The amendment’s very strictness in pushing for conservative priorities in 2013 could make it harder to realize conservative priorities in the future. Tax rates are lower today than they were in 1980, but could Reagan have slashed Carter-era rates under a constitutional regime that demanded such tight coordination between revenue and spending and erected massive hurdles to their decoupling?